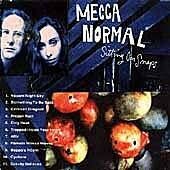 The most visionary of punk’s political bands, Mecca Normal see things in a different light. Because their tactics are more evocative than provocative, the Vancouver, Canada, duo hasn’t gotten as much attention as its fans and colleagues in Fugazi and Bikini Kill. But through seven albums over nine years, vocalist Jean Smith and guitarist David Lester have presented a consistent, evolving and luminous challenge to the reigning social order – what Smith calls, on “Vacant Night Sky,” “a false machine in motion/Passing through the clouds.” Mecca Normal operate so far outside the system that they see it as a satellite. Other bands brag about low-fi production values, but Mecca Normal don’t even have a rhythm section. Yet Sitting on Snaps is full of sounds, colors, shapes and beings. Mecca Normal’s approach is spare and self-contained, but long gone is the amateur primitivism of their folkish start; one might call this free punk, as avant and accomplished as its jazz counterpart. Hammered out in studios and on numerous tours, their music critique has achieved an exalted, pure essence, like a transcendent state of meditation. Their feminist and anarchist lyrics, always prescient, have become abstract images. Where Smith once sang about a woman going to Washington, D.C., in a Frank Capra-esque anthem, she now describes someone swimming: “Pamela makes waves/Wider and wider these days.” Smith’s lyrics have become riddles, written in precise but spare poetry. The messages are worth puzzling out: “Trapped Inside Your Heart” is about a woman living outside the myth of romantic love. “There’s always trouble/When you have to invent yourself,” Smith sings, her voice stronger in its iconoclastic creak than ever. Such plainsong, anarchistic credos – the opposite of polemical rhetoric – are common Mecca Normal offerings. 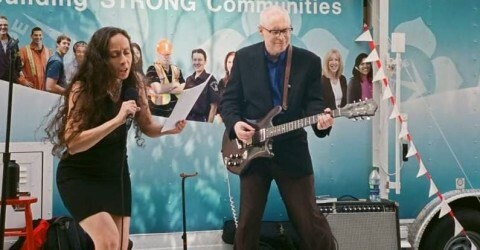 They’re not afraid of a sing-along; live, they encourage the audience to join in on the DIY take-back-the-night anthem “I Walk Alone.” Yet their music – Lester plays guitar like it’s a strange instrument found washed up on a beach, Smith’s vocals are glass shards melting and crystallizing – is far from pop-radio sensibilities. By twisting the delivery, they place power in individual interpretation, in the belief that one should be strengthened, not seduced, by melody. On Sitting they’ve added more than their usual minimal layer of sounds, overdubbing vocal harmonies and guitar parts, even playing with pianist Peter Jefferies on two tracks. This sudden expansion after the stark Flood Plain (1993) feels like a celestial illumination.